Eliminating prize disparity between genders is still a relevant issue throughout sports, especially pro cycling. This year, the Ridge at 38 Criterium will be issuing equal purse prizes for both men and women, which is something not as common as you might expect. With that in mind, we wanted to check in and follow up with last years’ winner, Julie Emmerman, but first a short introduction. Where should I begin haha – I used to race mountain bikes professionally and then I “retired”. I already had my doctorate degree so I built up private psychotherapy practice. After a short while, I really missed being around athletes so then I decided to specialize in sport psychology. Soon thereafter, I was hired by Garmin- Slipstream (at the time that’s what they [cycling team] were called) to be the sport psychologist for their Pro Tour riders. Eventually, I just missed being in the mix of competition as well as the social camaraderie so in 2009 I decided to race again. I dabbled mostly in local road racing at first and kept developing, honing fitness and skills. I have come a pretty good ways- I am not getting any younger and recently competed in the USA Pro National Championships where I finished 9th in the Time Trial. It’s an Olympic year so everyone is on superb form, which makes it super exciting. Do you have any hobbies or things you’re passionate about besides cycling? I love trail running in the fall and winter. In general, I love hanging out and spending time with my family while enjoying Colorado sunshine whenever and however I can. What brought you to the Criterium originally or how did you hear about it? 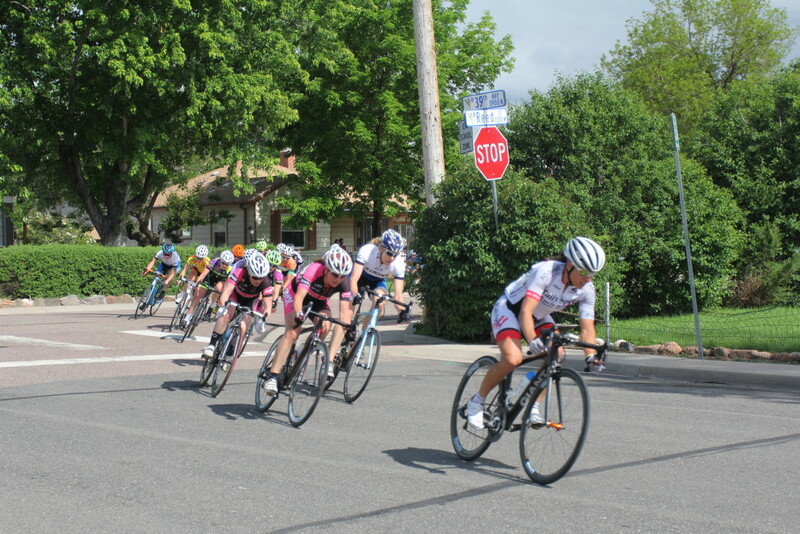 The Criterium is part of the BRAC [Bicycle Racing Association of Colorado] Series, so our team was trying to get points for the series overall. I knew that it would be important to win so that way we could accumulate more points. I also just like to go out and support local racing whenever I can. The woman’s fields tend to be kind of small, so I figure the more I can race, the better. It’s a great course and atmosphere. How did it feel winning last year’s Criterium? Haha, winning is always a good feeling! I enjoy the challenge of coordinating physicality with strategy. It was hard; I remember being exhausted afterwards! Do you do any special training in advance for it or anything different than normal? No, not really, because most of the races that we enter into professionally, the categories pro 1 and pro 2; there’s road races, criteriums, hill climbs, time trials, so we train pretty much all year round and for all of them. I am sure some people train specifically for crits, however. That said, will you be returning this year to defend your title? what would you tell others about the Criterium if they were interested? It is a completely family friendly place. There’s that huge park in the middle where they always have food vendors and fun stuff set up for kids. It’s really invigorating and fun! The race itself is on a great course where people can spectate from a lot of different corners to see the action happening. It’s a relatively short loop so there’s not much down time between when the racers will come around again. The course also lends itself to break aways and attacks which means that some riders will try to separate from the main peloton. That usually makes for a very exciting race. I would sum up the event as lively, fun and inclusive. Traditionally Criteriums don’t have equal purses and we’re trying to change that, do you have an opinions or thoughts on that? It’s awesome that this year’s Criterium is offering equal prize money. Personally and on behalf of all women I want to say thank you. I’m all for trying to reduce that disparity. I understand the common local argument of, “Well there are so fewer female racers, why should they have equal prize money?” But at National events the women’s fields are 80+ strong. I don’t have a quick answer or an easy solution to offer but having equal prize money makes a strong positive statement. Hopefully, sponsors see the market value of putting their money behind women athletes and improve their strategies for reaching target audiences, whether it is pro cycling, soccer, etc. I am very proud of the Ridge at 38 and Wheat Ridge Cyclery for offering equal prize money this year. So, again thank you! Julie, thank you very much again for your time this evening. Was there anything you wanted to add? It is an awesome event and I hope women show up in all categories because it is really a great course and a great opportunity. Join us June 12th from 9:00am-7:00pm for The Ridge at 38 Criterium Bike Race & Brewfest. This is a FREE event for the whole family!